South Africans fought hard for their democracy! They resisted Apartheid power, were tortured, deported and died in order to be able to vote for the African National Congress (ANC) and Nelson Mandela in 1994. Now, 22 years on, Zuma is making a mockery of their struggles for democratic accountability as he allows the Gupta brothers to direct the country’s economic policy. The recent explosion of evidence of the power of the Gupta brothers at the heights of South Africa’s government, in the executive, reveals the serious breach of democracy perpetrated by the country’s president. While the Gupta family’s manoeuvrings have been documented for many years, the extent of the brothers’ influence over Zuma came to light when former Minister of Finance Nhlanhla Nene was sacked in December 2015. Deputy Finance Minister Mcebisi Jonas confirmed that he had been offered the position of finance minister by a member of the Gupta family. This well-reported fiasco reveals the extent of Zuma’s (and the ANC’s) irresponsibility to the South African people as the Guptas proceed in the appointment of cabinet ministers. The “one unfortunate event” is actually the moment when the Guptas’ coup became visible. Conventional wisdom recognises coups as usually being carried out by armed forces and practically never by anyone else. But understanding the coup as a decisive exercise of force in politics which alters the existing government by a small group leads me to qualify the sacking of Nene as a coup. Who are the Guptas? Ajay, Atul and Rajesh Gupta are three brothers from the northern Indian state of Uttar Pradesh. They arrived in South Africa in 1993 as the country was transiting to democracy. Coming to South Africa with money made out of IT business, they went on to invest in mining, tourism, and media outlets. See figure below. This is the same old same old relations between the state and capitalism. Seemingly nothing new here. Fernand Braudel’s work on capitalism and civilisation reminds us that capitalists use the state to mould the economy to their interests and will. Capitalism, for Braudel, is about more than making profits from production; capitalism is about connections and succeeds when it becomes part of the state, indeed when it becomes identified with the state. For the Guptas this means links not only to Zuma but also to other members of his family. 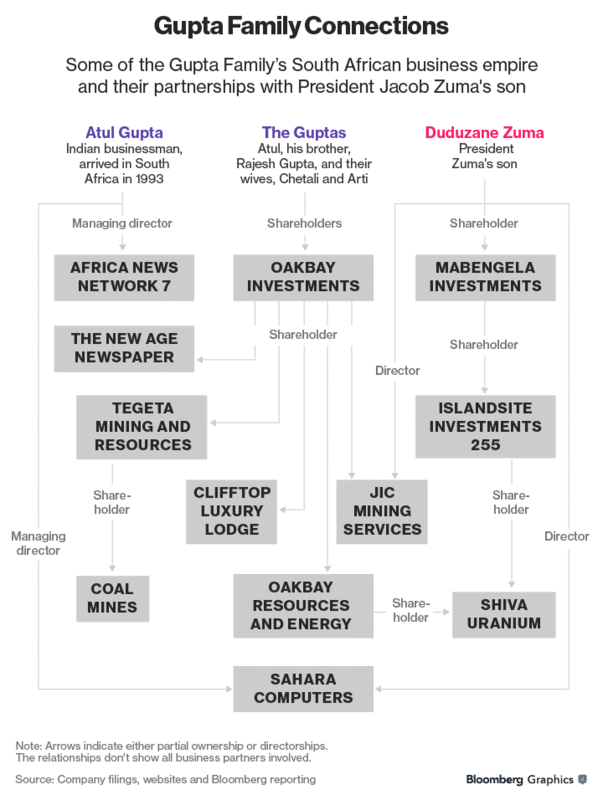 The above diagram showing how Zuma’s son is knitted into Gupta family business structures. The links also extend to Bongi Ngema-Zuma, one of the president’s wives, who worked for the Gupta-controlled JIC Mining Services as a communications officer and Duduzile Zuma, Zuma’s daughter, who was a director at Gupta’s Sahara Computers. Economic Freedom Fighters (EFF) leader Julius Malema (2016) sees the Gupta influence as ‘colonisation’ of the country by a family. I think this gets closer to what is happening than the idea of a simple ‘state capture’ by business. This is not either patronage as qualified by Mmusi Maimane, leader of main opposition Democratic Alliance. While he is right that the Guptas get extraordinary privileges from the president, this is not patronage as conventionally used in the African context. Rather this is the rise of an oligarchy through family dynasties. Monopolies and oligarchies, as I believe is increasingly the case of South Africa, are a function of the state. So while this all looks like what we expect from a capitalist state – to protect the interests of an elite – I think a different type of capitalist elite is trying to take root in South Africa. In the 1990s, the ANC government and a new black capitalist elite were set on reinforcing South Africa as an international financial centre along the lines of neoliberal ideology and reforms. This was evident under Thabo Mbeki’s leadership 1999-2008 where the preferred means to domestic development were through privatisation of services, money raised on capital markets through public debt, and a widening and deepening of national credit markets for individual responses to structural poverty. Zuma is doing something different from the Mbeki era, something that frightens even the neoliberal capitalist crowd in Sandton. The powerful group of capitalists who historically controlled the mines, energy, big industry, and finance worked to ensure that the transition to democracy would not change this cluster of power and that the new government would create the kind of macroeconomic stability that would facilitate their activities. Zuma, however, is not playing ball. He is making seemingly stupid financial decisions that spin the Rand down, deflate stock markets and downgrade the county’s rating on global markets. This is not capitalism as normal. This is not the capitalism inherited from British financiers during the last century. This is ceding power at the heart of the state in favour of family dynastic interests. The Guptas are not part of the new ‘Black Diamond’ elite such as the Cyril Ramaphosas– who was close to ANC power through historical struggles, or the Patrice Mostepes – rags to riches stories of economic ambition in a new South Africa. The Guptas are not aligned to ANC history and they don’t give a damn about the ordinary South African waiting to see her life improve in the post-apartheid era. No, I believe that what is effectively taking place is a ‘soft’ coup. ‘Soft’ because it is not military but rather an ‘oligarchical coup’ carried out by wealthy families. Successes of coups depend on the passivity of the existing state apparatus and, in the case of the ANC, an inability to confront Zuma and his allies. The Gupta family’s power to replace key ministerial positions is given by Zuma and endorsed through the passivity of the ANC. This sham is worthy of impeachment. Zuma makes a mockery of South Africans’ ongoing struggles for change, economic justice and accountability via elections. Zuma cons the public into believing that he is their representative and voice, working for a better country. He is not. He is feathering his own nest egg. He is jeopardising the still fragile democracy of only 20 years. Using the 1998 Executive Ethics Act, opposition parties and the public must call for an investigation to see if Zuma breached the code of ethics governing the conduct of members of the Cabinet. The move to a control of the few for the few, an oligarchy, must be blocked. The work then needs to continue to tackle the enormous issue of systemic poverty and unemployment in the country. South Africa has no time to waste. Elizabeth Cobbett is based at the University of East Anglia, UK. Her focus is on finance in Africa. Malema, Julius. 2016. “Meet the Guptas: Indian family ‘ruling’ South African President Jacob Zuma”, http://www.emirates247.com/news/meet-the-guptas-indian-family-ruling-south-african-president-jacob-zuma-2016-02-10-1.620474 (Accessed March 24, 2016).